Must visit Kali Puja Pandal Theme of Barrackpore, Kali Puja Pandal Theme of Sodepur, Top Kali Puja Theme of Agarpara, must visit Kali Puja pandals of Barahanagar, Best Kali Puja Pandals of North Kolkata. Like Durga Puja; nowadays many Kali Puja Organizers of Kolkata are coming up with creativity & themes in Kolkata. Kali Puja is on 13th November 2012 (Tuesday) and now we will let you know what are must visit Kali Puja Pandals of North Kolkata’s places like Barrackpore, Manirampur, Sodepur, Agarpara, & Barahanagar. Those who want to know the Best Kali Puja Pandal names of North Kolkata & want to know 2012 Kali Puja Pandal Theme details of North Kolkata are requested to pay visit to these below mentioned Top Kali Pujas of North Kolkata. • Kali Puja Pandal & Theme of Talpukur Bhattacharjee Para Nabin Sangha Club: - Talpukur Bhattacharjee Para Nabin Sangha Kali Puja pandal is developed like a Temple and Sabeki typed Maa Kali Idol. On their 13th year; they are going to organize Cultural Programmes and going to distribute books, blankets, clothes to the needy people. • Kali Puja Pandal & Theme of Anandapuri A Road Club: - Anandapuri A Road Kali Puja is more like a family puja maintaining every rituals. Sabeki types Kali Maa Idol. • Kali Puja Pandal & Theme of Barrackpore Mistri Ghat Boys Club Club: - Barrackpore Mistri Ghat Boys Club Kali Puja pandal is developed like a Temple made by Thermocal, Fiber, ‘Pora Maati’, Plaster of Parris etc. This is the 40th year and they are coming with a unique Maa Kali idol looks like ‘Kasti Pathor’ and like Anandamoyee Maa. • Kali Puja Pandal & Theme of Barrackpore Young Man Association Club: - Barrackpore Young Man Association Kali Puja pandal is developed like a Tribal Temple of Kangra Valley (Himachal Pradesh). This is the 55th year and the pandal made of ‘Bamboos’, ‘Hogla Leaf’ etc. 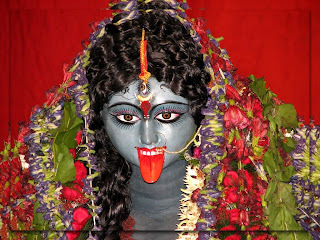 Maa Kali idol is Sabeki type and you will get to feel Aadibasi Village Atmosphere. • Kali Puja Pandal & Theme of Manirampur Daspara Club Club: - Manirampur Daspara Club Kali Puja pandal is developed like ‘Akshardham Temple of Gujarat’ and made of ‘Chot’, ‘Paat’ etc. This is the 100th year and organizers are organizing ‘Seat & Draw Competition for Kids’, ‘Cracker Show’, ‘Magic Show’ , ‘Putul Naach’ etc. • Kali Puja Pandal & Theme of Manirampur Young Association Club Club: - Manirampur Young Association Club Kali Puja pandal is developed like a Temple made of ‘Ice-cream Spoons’, ‘Wood dust’, ‘Chot’ etc .This is the 48th year and Maa Kali Idol have the ‘Daak er Saaj’. • Kali Puja Pandal & Theme of Aamra Sobai Club Club: - Aamra Sobai Club Kali Puja pandal is developed like a Temple of Maharashtra and made of ‘Chot’, ‘Pitol’, ‘Bet’ etc. Maa Kali Idol is around 14 feet in height. • Kali Puja Pandal & Theme of Universe Club Club: - Universe Club Kali Puja pandal is made of ‘Talpatar Pakha’, ‘Ply’, ‘Aluminum plates’ etc and looks like a Temple. This is the 87th year and they are organizing cultural programmes too. • Kali Puja Pandal & Theme of New Life Club Club: - New Life Club Kali Puja pandal is made of ‘Rumal’, ‘Pora Mati’, ‘Hogla Pata’ etc and looks like a ‘Naat Mandir’. • Kali Puja Pandal & Theme of Swamiji Clum Club: - Swamiji Clum Kali Puja pandal is made of ‘Paat er Dori’, ‘Shola’, ‘Thermocal’, ‘Chot’ etc and looks like ‘Tailand’s Pagoda’. This is the 62nd year and Dakhhina Maa Kali idol is around 7 feet in height. • Kali Puja Pandal & Theme of Barrackpore Vivekananda Club Club: - Barrackpore Vivekananda Club Kali Puja pandal is looking like a ‘Pyramid’ made of ‘Ply’, ‘Chot’, & ‘Sand’. 7 feet tall Maa Kali idol. • Kali Puja Pandal & Theme of Sodepur Janakalyan Parishad Club: - Sodepur Janakalyan Parishad Kali Puja pandal theme is Tom & Jerry. The pandal is around 33 feet tall. • Kali Puja Pandal & Theme of Agarpara Sadhurbagan Jubakbrinda Club: - Agarpara Sadhurbagan Jubakbrinda Kali Puja pandal is like French Girja. Maa Kali idol is like ‘Sabeki Pratima’ on their 53rd year. • Kali Puja Pandal & Theme of Agarpara Battala Deep Sangha Club: - Agarpara Battala Deep Sangha Kali Puja pandal is like a old temple of Birbhum. Nearly 25 feet tall pandal and ‘Bastro Bitoron’ programme is going to be organized on their 32nd year. • Kali Puja Pandal & Theme of Agarpara Nababani Sangha Club: - Agarpara Nababani Sangha Kali Puja pandal is like a Temple nearly 30-feet tall. Special attraction is Live Baul Gaan. • Kali Puja Pandal & Theme of Nimta Sishu Sangha Club: - Nimta Sishu Sangha Kali Puja pandal theme is ‘Satidaho’. On their 39th year; they are going to show 21 different characteristic of Goddess. • Kali Puja Pandal & Theme of Barahanagar Deshbandhu Road Sarbojanin Club: - Barahanagar Deshbandhu Road Sarbojanin Kali Puja pandal is one of the oldest & most popular Kali Pujas of Barahanagar area (North Kolkata). It’s the 78th year and a Fair (Mela) is going to be held on Kalitala Ground like every other year. Sabeki Type Kali Maa Idol. • Kali Puja Pandal & Theme of Barahanagar Narayani Sporting Club Club: - Barahanagar Narayani Sporting Club Kali Maa is developed like Bhabatarini Kali Maa of Dakshineswar Temple. Dakshineswar Kali Temple, Adyapeath Temple, Sodepur Sukhchar Kali Temple and few more renowned Kali Temples of North Kolkata are not mentioned in the above list.